Based on the classic good-versus-evil fairytale by the Brothers Grimm, this weekend’s fanciful and fun family show features deft characterizations and choreography by Artistic Director Charles Maple as well as exquisitely crafted costumes and colorful sets created by the company’s talented family of volunteers. As Snow White, the 16 year-old Willson brings a refreshingly youthful grace and poise to her leading role. It’s the perfect foil for the reigning beauty the Evil Queen, portrayed by fellow Newport Beach resident Cinamin Stulik. Stulik’s character is the embodiment of machiavellian malevolence, which sets the stage for the final showdown between Snow White’s ingenuous innocence and the Queen’s eaten-with-envy agenda. “The ballet’s young dancers are very talented, but it’s often difficult to play older roles as a teenager. Charles needed the Queen to have more intense feelings,” says Stulik of her casting as the evil monarch. A life-long dancer who studied at UCI as well as Joffrey and Boston Ballet’s summer intensives, her experience and mature professionalism is immediately obvious in the sharply effortless lines and beautifully arched feet underlying an edgily dramatic portrayal. A girl hunched over homework as a counterpart stitched elastic bands and ribbons onto her shoes, listening to the youngest among them, who tittered gleefully, cradled comfortably in the laps of older girls. 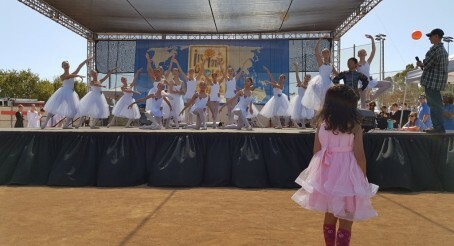 Ballet, in all its glory, was front and center at the Maple Conservatory of Dance in Irvine. Last Friday, about 80 performers pieced together pliés, arabesques and ports de bras in a nearly two-hour run-through of the Maple Youth Ballet’s rendition of the Brothers Grimm fairy tale “Snow White and the Seven Dwarfs.” The dance company performs in front of audiences Saturday at Irvine’s Barclay Theatre. At the heart of the production is director and choreographer Charles Maple, who conjures up an image of a master puppeteer, guiding teachers, dancers, set builders and costume designers. Armed with extensive experience — he worked with George Balanchine, Mikhail Baryshnikov, Antony Tudor, Jerome Robbins and other dance luminaries — Maple established the eponymous ballet school in Irvine nearly six years ago.